FO: Foxy Hat | Stitch, Brinn, Stitch! Pattern: My own, but I might write it up cause it’s bitchin’. Yarn: Some fluffy acrylic nonsense plus white acrylic and black cotton. Sorry for the crappy pictures. The view from my window today is this. It’s been raining since last night. 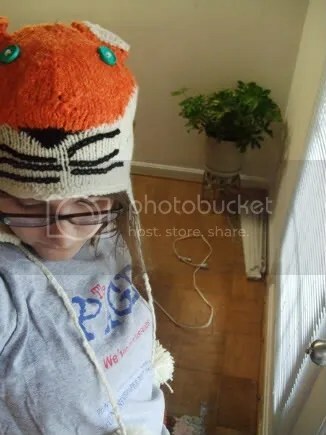 I made this hat on commission for a friend to give as a Christmas present to a friend of hers that really likes foxes. It’s based on this hat from Urban Outfitters. I think I did a pretty good job at copying it. I really like how this hat came out. The floats where I changed colors are just a liiiiittle tight, but it’s totally still wearable. 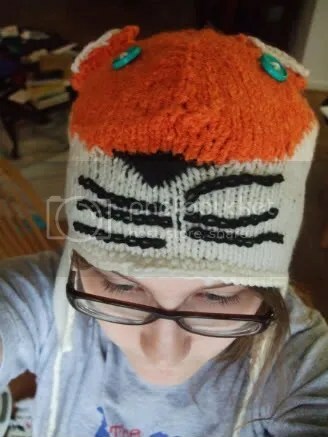 The fluffy yarn worked out perfectly, and I think the hat looks just like a fox. 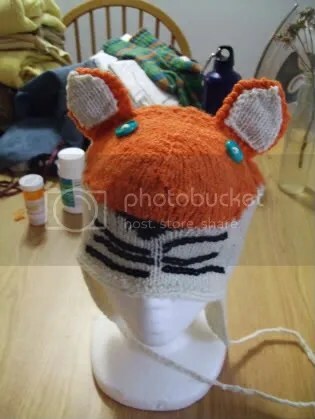 The yarn I used is a lighter orange than the UO hat, but I think foxes are actually pretty orange, so I made a good color choice. The earflaps are in acrylic as well (the recipient has a wool allergy), so after I knit them, they were really curly and stiff and unpleasant looking. I took a change and brought out my iron and steam blocked the whole hat. As you can tell by the pictures, it worked out SO WELL. Seriously, why didn’t anyone ever tell me how magical steam blocking acrylic is? It’s much softer, lies flat, and the stitching is much looser, like a commercial knit. WONDERFUL. In other knitting news: I am still making shark mittens. So there’s that.